"Few days after the release of the Android consumer App 1.6.2, today I am pleased to announce the release on the Google Play Store of a new version which includes support for German language and a totally redesigned Purchased Products Digital Card", said Mrs. Dorothea Bousek, Head of Luxury Brands Worldwide Management during today's weekly conference call. "This release is extremely important to us as we are ready to launch Validactor in Germany, Austria and Switzerland. These countries, with their highly demanding markets and customer base, are a perfect fit for the Validactor offering", added Dorothea. 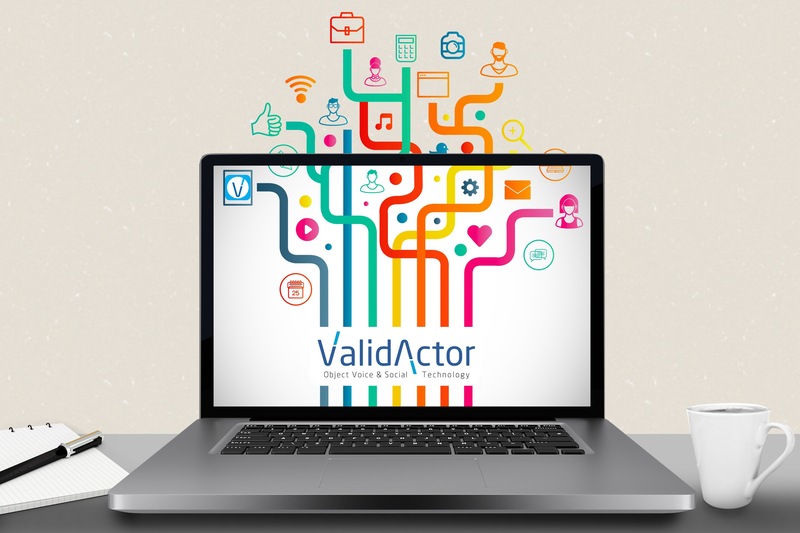 Validactor is not only anti-counterfeit, it delivers many additional features such as product traceability, brand protection, big-data analysis, product's flagging, social networking, sales front-store, advanced marketing techniques, "Made in" management and much more. 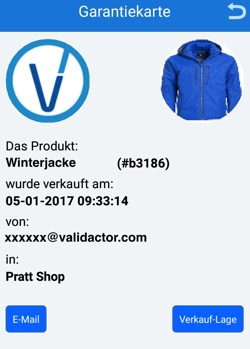 Addendum: Today, 24th of February 2017 we have also released the German version of the Validactor POS: the App specifically designed and developed for store managers. We at Validactor consider system and data security a priority #1 task. 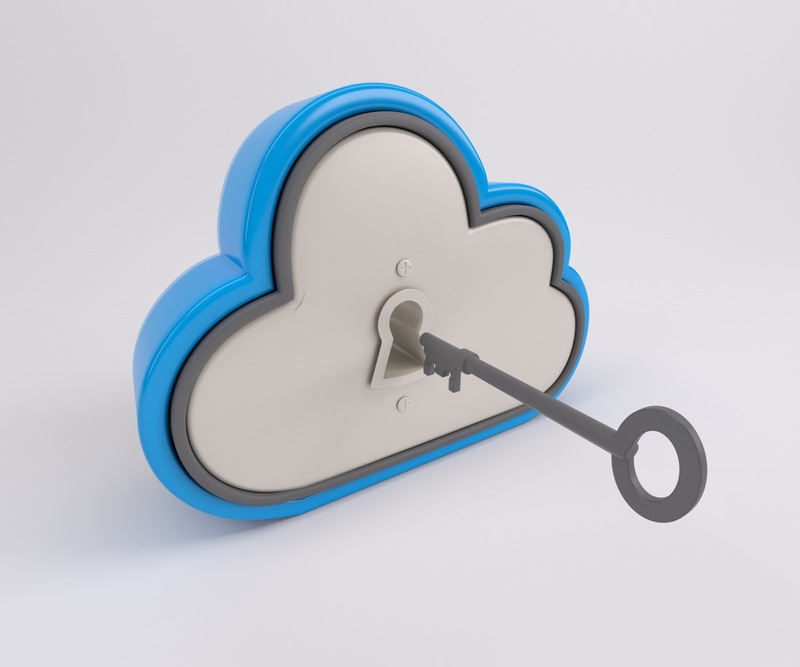 Our systems are hosted on the AWS Cloud implementing some of the best and more secure technologies available today. Data security at Validactor is the highest priority. As a Validactor customer, manufacturing companies will benefit from a data center and network architecture built to meet the requirements of the most security-sensitive organizations. An advantage of the AWS cloud is that it allows us to scale and innovate, while maintaining a secure environment. AWS provides Validactor with trusted, cloud-based solutions to help meet any business needs. Validactor solutions in the AWS Cloud helps manufacturing companies to get our integrated suite of solutions and applications up and running faster while providing the same level of security that organizations like Pfizer, Intuit, and the US Navy rely on. Validactor thru AWS also provides resources around the world, so that Validactor solutions are deployed where your customers are. Recently I was coming back home from a business trip, and lost my luggage. When I realised that I was the only one with no luggage at the carousel in the airport Arrival Hall I felt sad. I filed my claim and went back home. As soon as I reached home I received an email from someone who found my luggage. By simply scanning the code on my luggage, this person could connect directly with me anonymously. And I was able to get my luggage back soon. Thanks to the Validactor Lost&Found technology my luggage will not be lost anymore. "It is with pleasure that today I announce the start of joint efforts with a major eyewear company with worldwide presence to combat counterfeits in the eyewear world wide markets" says Dino Sergiano of Validactor " the market knowledge possessed by the manufacturing company along with the social and anti counterfeit capabilities added by Validactor combined together will make eyewear counterfeiters life extremely difficult" added Dino. Both companies decided not to reveal further details on the agreement in order to avoid any possible interference due to the sensible subject of the agreement. Validactor delivers a full suite of product management and traceability services, including anti-counterfeit security measures, brand protection, Big Data analysis, product's status flagging, social networking, sales front-store, advanced marketing techniques and "Made in" management. Here below a representation of the main reasons why our luggage gets lost when we travel by air. The main reason seems to be "Transfer mishandling" but this data alone should not be considered always the only reason to blame. "Failure to load" or "Ticketing error" together accounts for more than 30%. Also "Arrival Mishandling" alone with its mere 3% contributes to have hundreds of thousands of stranded luggage worldwide. Validactor with its Lost&Found solutions helps travellers and manufacturers to dramatically reduce the yearly number of stranded luggage. Thanks to Shatadru and to the entire Kolkata (India) based team for the release on the iOS Validactor Consumer App 1.6.2 This release along with the corresponding Android version released few days before includes major improvements and new functionalities such as Customer VACode and Purchase History. "We announce today the release of a streamlined interface of our Corporate website, in line with the ongoing process of building an easily recognisable brand image. Validactor combines security, easiness of use and massive computer power to bring efficient marketing solutions to the participating companies and their customers", said today Mariella Profeta, Managing Director of Validactor SRL. "All our efforts are focused on IP and brand protection along with new services offered to both manufacturing companies and their customers. We are introducing a brand-new way of customer-manufacturer interaction." added Mariella. 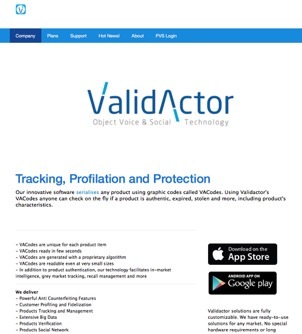 Validactor delivers a full suite of product management and traceability services, including anti-counterfeit security measures, brand protection, Big Data analysis, product's status flagging, social networking, sales front-store, advanced marketing techniques and "Made in" management solutions. This is Mario, the character that from time to time, will inform you about new features, new Hot News and worldwide announcements. Thanks Mario, nice to meet you! Counterfeit goods: a bargain or a costly mistake? The production and sale of counterfeit goods is a global, multi-billion dollar problem and one that has serious economic and health ramifications for Governments, businesses and consumers. Counterfeiting is everywhere - it can affect what we eat, what we watch, what medicines we take and what we wear - and all too often the link between fake goods and transnational organized crime is overlooked in the search for knock-offs at bargain-basement prices. Counterfeiting is a hugely lucrative business, with criminals relying on the continued high demand for cheap goods coupled with low production and distribution costs. The illegal activities related to counterfeiting take advantage of unwitting consumers and bargain-hunters, exploiting people's appetites for cut-price brands or simply their financial position. While the costs are difficult to quantify - and do not include non-monetary damage such as illness and death - the value of counterfeiting is estimated by the OECD to be in the region of $250 billion per year. While counterfeiters continue to reap significant profits, millions of consumers are at risk from unsafe and ineffective products. It is a truly transnational problem. The World Customs Organization noted that in 2008 counterfeit products destined for 140 countries were detected. In many countries the absence of deterrent legislation encourages counterfeiters, since they have less fear of being apprehended and prosecuted than they would for other crimes. Counterfeiters engage in elaborate plans to disguise their activities. They establish fictitious businesses and front companies. They exploit border-control weaknesses and poor regulatory frameworks. And they use false documents to obtain pharmaceutical ingredients, as well as manufacturing equipment to replicate genuine products. The criminal networks behind counterfeiting operate across national borders in activities that include the manufacture, export, import and distribution of illicit goods. The scale and ingenuity of the trade in counterfeits poses a formidable challenge to law enforcement authorities, as counterfeiters adopt extremely flexible methods in order to mimic products and prevent their detection. Criminal organizations are also often involved beyond just producing and moving counterfeit goods, with many also trafficking drugs, firearms and people. Counterfeiters are involved in the illegal production of knock-offs in virtually every area - food, drinks, clothes, shoes, pharmaceuticals, electronics, auto parts, toys, currency, tickets for transport systems and concerts, alcohol, cigarettes, toiletries, building materials and much, much more. Often the temptation for consumers can be too strong to resist, with many not understanding the risks and ramifications attached to this illicit industry. Buying a counterfeit handbag or pair of jeans, for example, might not be regarded as an illegal transaction - simply a cheaper way to wear the latest fashion goods. However, often little thought is given to how the money may ultimately end up in the hands of organized crime groups or how the industries that rely on legitimate sales suffer. The buying of fraudulent pharmaceuticals can obscure the long-term risks: there are numerous examples of disability and death caused by tainted medication, and such pharmaceuticals contribute to the growth of drug-resistant diseases. Even obscure purchases like safety goggles or electrical plugs that have been illegally copied and reproduced present significant risks, given their lower quality. Counterfeit cigarettes also present multiple risks: they are even more harmful than genuine cigarettes, as they may contain much higher levels of nicotine and other dangerous chemicals such as arsenic, benzene, cadmium and formaldehyde. The criminals behind these operations present huge challenges to all sectors of society: they threaten public health through the production of fraudulent medicines; they deprive the public sector of tax revenue through bypassing official channels; they add to public spending through increased law enforcement work to counter this illicit trade; and they increase the price of legitimate products as companies seek to recoup their losses. The ramifications of counterfeiting affect everyone, with Governments, businesses and society being robbed of tax revenue, business income and jobs. The flood of counterfeit and pirated products creates an enormous drain on the global economy by creating an underground trade that deprives Governments of revenue for vital public services and imposes greater burdens on taxpayers. It also leads to more public resources being spent on fraud-detection methods by public sector authorities and larger intelligence and policing budgets being needed to counter sophisticated schemes and networks. Counterfeit goods also undermine employment, as products are copied and produced illegally, thereby displacing sales of original merchandise and reducing the turnover of legitimate companies. Fraudulent medicines also have a direct impact on increased medical costs due to prolonged treatment periods and medical complications in the spread of treatment-intensive diseases. The prices of products also go up because companies increase security systems to counter organized criminal activities and have to invest more in research and development. One of the most harmful forms of counterfeit goods is fraudulent medicines. In recent years there has been a marked increase in the manufacturing, trade and consumption of these products - often with harmful results, and at times fatal. The sale of fraudulent medicines from Asia to South-East Asia and Africa alone amounts to some $1.6 billion per year - a sizeable amount of money being fed into the illicit economy. The World Health Organization estimates that up to 1 per cent of medicines available in the developed world are likely to be fraudulent. This figure rises to 10 per cent in various developing countries, and in parts of Asia, Africa and Latin America, fraudulent pharmaceuticals amount to as much as 30 per cent of the market. In an article in the medical journal The Lancet in mid-2012, it was noted that one third of malaria medicines used in East Asia and sub-Saharan Africa are fraudulent. Tampered formulations present particular dangers. These types of medicines are found either to contain the wrong dose of active ingredients, or none at all, or to have a completely different ingredient included. In some cases, fraudulent medicines have been found to contain highly toxic substances such as rat poison. Fraudulent medicines also deprive sick people of treatment, leaving them vulnerable to the disease they are meant to be fighting. They also make some of the world's most dangerous diseases and viruses stronger by contributing to the development of drug-resistant strains, as the active ingredients are no longer able to work correctly. More resistant strains are then passed on to other victims, and the legitimate drugs they take to fight the same disease are less effective. All kinds of medicines - both branded and generic - can be made fraudulently, ranging from ordinary painkillers and antihistamines, to "lifestyle" medicines, such as those taken for weight loss and sexual dysfunction, to life-saving medicines including cancer treatment and heart disease drugs. Medications for treating depression, schizophrenia, diabetes, blood pressure and cholesterol are also among the commonly faked medicines. In West Africa there has been a marked increase in fraudulent medicines, including antibiotics, antiretroviral drugs and medicines to fight life-threatening diseases such as malaria and tuberculosis. Meanwhile in Asia - a key manufacturer of legal medicine - the production of fraudulent drugs is seen to be on the rise. According to statistics from the World Customs Organization, around two thirds of counterfeits (medicines and other goods) detected globally in 2008 were shipped from East Asia. Another area that continues to be exploited by counterfeiters - and one that is often not considered in the public mind when discussing fake products - is foodstuffs. 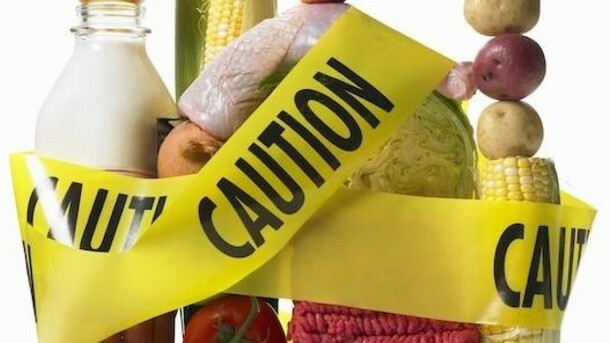 Every year thousands of consumers throughout the world are deceived into buying expensive counterfeit foodstuffs. A ploy favoured by criminals is to intentionally mislabel and misrepresent foods as luxury items or as originating in certain countries, allowing them to raise prices. A recent estimate based on data from the United Kingdom Food Standards Agency suggested that fraud could affect as much as 10 per cent of all the food bought in that country. One such example is that of "wild" salmon, which, it is estimated, is in fact farmed fish in one out of every seven cases. But it is not simply a matter of people being conned into believing that they are eating superior food. In just one example of the life-threatening potential of the trade in counterfeit foodstuffs, thousands of Chinese babies became sick in 2008 after drinking contaminated milk formula containing melamine, a chemical normally used in plastics. While the chemical is banned from use in food, it is added to watered-down milk in order to make the liquid appear higher in protein when tested. The ripples of this food scare were felt internationally, with fears that the contaminated products may have reached Europe and beyond. There have also been cases where rat poison and other dangerous chemicals have been found to be present in fraudulent food in place of other more expensive and legitimate additives. The counterfeit business is a global operation spread across numerous countries and organized by cross-border criminal networks. In a bid to tackle these crimes there is an ever-growing need for action at both the local and the international level. The United Nations Convention against Transnational Organized Crime is the world's most inclusive platform for cooperation in tackling this issue.170 countries are currently party to the Convention and have committed themselves to fighting organized crime locally and internationally by such means as collaboration and ensuring that domestic laws are suitably structured. In October 2012 UNODC will be hosting the Conference of the Parties to the United Nations Convention against Transnational Organized Crime. This biennial series of meetings brings together Governments from across the world to promote and review the execution of the Convention in order to ensure better implementation in tackling this international issue. Organizations such as INTERPOL and the World Customs Organization are also central to tackling this sort of crime, particularly given the cross-border nature of the operations behind counterfeiting. This provision of a crucial link between law enforcement agencies is a good example of the kind of actions necessary to curb transnational organized crime networks. There is also a great need to build more awareness of the scale of the problem. The responsibility for this is widespread, with international organizations, public health authorities, trade organizations, consumer groups and concerned citizens all able to play their part and make people aware of the dangers of counterfeit goods to health and safety. Private companies complicit in this trade should, for instance, be named and shamed, and codes of conduct more rigorously enforced. Law enforcement agencies should also take a tougher stand against counterfeiters, and that stance ultimately has to be backed up by relevant and comprehensive local laws. Coordinated and cross-sector action at the international level is vital for identifying, investigating and prosecuting these criminals. One such area in which measures are lacking in many parts of the world is that of rogue Internet pharmacies, which operate with little fear. Consumers also have a responsibility to exert their influence with their purchasing choices. While consumers often cannot identify counterfeit goods, such as medicines containing dangerous products, the more evident purchases of counterfeit products should be shunned. Counterfeiting networks can - and will - continue to operate as long as customers support this form of illegal trading. If you know a film has been illegally copied and is being sold as a knock-off, don't buy it. If your favourite designer brand is clearly not made by your favourite designer, stay away. Beyond these obvious counterfeit products, stay alert to other warning signs. If a medicine that you know normally requires a prescription is available online without any sort of script from a doctor, then it could harm your health, perhaps irreversibly. Remember - while these purchases may save you money in the short term, the longer-term losses are far more costly. Organization for Economic Cooperation and Development, "Magnitude of counterfeiting and piracy of tangible products: an update", November 2009. Available fromwww.oecd.org/dataoecd/57/27/44088872.pdf. This figure does not include domestically produced and consumed counterfeit products nor the significant volume of pirated digital products being distributed via the Internet. If these items were added, the total amount of counterfeiting worldwide could be several hundred billion dollars more. World Customs Organization, "Customs and IPR report: 2008". Available fromhttp://www.wcoomd.org/files/1.%20Public%20files/PDFandDocuments/Enforcement/IPR%202008%20EN%20web.pdf. The Globalization of Crime: A Transnational Organized Crime Threat Assessment (United Nations publication, Sales No. E.10.IV.6.2010). Available fromwww.unodc.org/documents/data-and-analysis/tocta/TOCTA_Report_2010_low_res.pdf. World Health Organization, "Counterfeit medicines: an update on estimates", 15 November 2006. Available from www.who.int/medicines/services/counterfeit/impact/TheNewEstimatesCounterfeit.pdf. Kate Ravilious, "Buyer beware", New Scientist, vol. 192, No. 2577 (November 2006), pp. 40-43. Valid POS for Apple's iOS released today. Following the recent release of the Validactor POS for Android, today the Apple App Store has approved the release of the iOS version of the App specifically developed for Validactor Enabled Store Managers (named Valid POS). "This is the App that makes possible the activation of a number of customer focused services" said Mrs. Dorothea Bousek, Head of Luxury Brands Worldwide Management during today's conference call with prospect customers. "Our goal is to help manufacturers fight illegal counterfeit markets and protect brand and relevant intellectual properties" added Mrs. Bousek. “It is with great pleasure that I announce to you the new release of the Android Validactor POS, an innovative App designed specifically for Store Managers.” said Mrs. Dorothea Bousek, Head of Luxury Brands Worldwide Management at today’s investors meeting held in Vienna, Austria. “Validactor is taking a great step forward today; the new functions activated in the Validactor POS App, such as warranties management, sold product tracking and product ownership control, make it a revolutionary, efficient and fast tool, tailored to the real customer needs. “ added Mrs. Bousek. Have you Lost your Luggage? You are lucky! "As of today we have completed the deployment of the new Lost&Found feature. Any sold product can be tracked back to its original customer" said Mariella Profeta, Ceo of Validactor SRL during today's press online conference call. "This new feature allows Validactor customers to offer an innovative and free service to all their customers regardless of the purchased product. Luggage makers are the ones who will immensely benefit from this innovation at no extra cost". 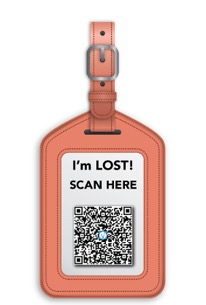 The Validactor Lost&Found feature allows anyone who founds for example a lost or stranded luggage to be reconnected to the owner. All is done by a simple anonymous scan of a special QRCode named VACode. 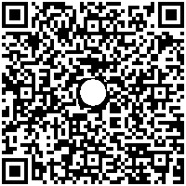 The scan can be done by any QR Code scanner. The informations are sent anonymously and only with the agreement of both parties they cam meet or ship the lost luggage to the final destination. *	Recall Management – Recalling tainted or defective products is a challenge common to many manufacturing industries. If the distribution of batches or lots is not tracked through distribution and retail channels, then the recall cannot be done precisely, requiring a costly general recall of all products. *	Alerting – You can use this data to alert appropriate parties when things are not going according to plan, enabling earlier intervention. The sooner you know something went wrong, the broader the choices for mitigation and containment. *	Process Improvements – Analysis of auto-captured data can be used to improve end-to-end processes and to look for excess dwell times, unnecessary handling or poor execution. The rise of RFID has encouraged the development of these types of analytic tools. *	Expiration Management – For limited shelf-life products, the batch number can be used to determine End Of Life (EOL) and help enforce management disciplines across the supply chain including: First Expired, First Out (FEFO); First In, First Out (FIFO); or no sell after sale date. This may require various supply chain partners (e.g., third party distributors and retailers) to capture, monitor, communicate, and act on expiration data. Serialization technology: What is it? 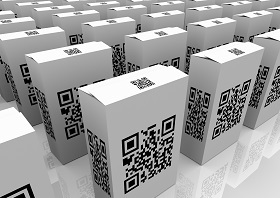 Serialization technology is a way to uniquely identify products in the supply chain down to the item level (rather than at the batch level), we at Validactor implement this technology via specific QRCodes named VACodes. Distributors and final customers along the supply chain read these serialized VACodes and send information into the back-end system. This in turn feeds data to the serialized management Validactor system called PVS. The PVS is an integrated event and object manager that provides the basic platform for tracking uniquely identified objects and events relevant to those objects. By using it to compare expected and actual events, companies uses our track-and-trace features, identify exceptions, and trigger alerts. Among their support for features like recall management, the Validactor solutions for serialization also enable third-party track-and-trace applications. Track-and-trace functionalities facilitate greater control over product recalls and product quality. It became especially important for pharmaceutical companies facing state-level mandates to follow the detailed “pedigree” of a drug — which requires that manufacturers track every point of custody for each drug. Validactor has brought this technology to any kind of product: food non food, perishable or not, expensive or cheap, manufactured or naturally grown. No matter the kind we can serialize it. 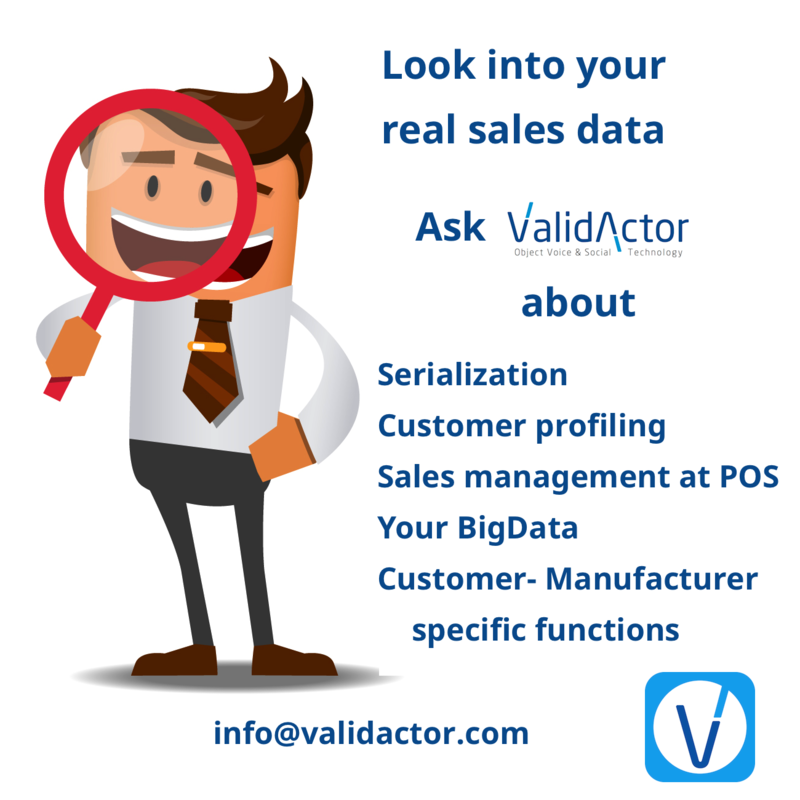 Validactor functionalities offer an effective pedigree and serialization solution that is technology-agnostic and can be customized to meet individual enterprise needs. Serialization technology also supports more accurate pinpointing of products and all their components so you can accurately target the right products for recall. For example, a worldwide developer, manufacturer, and marketer of any kind of wine faced a voluntary recall of one of a particular vintage. The company turned to serialization and it was able to pull the units in question and resupply the market within 48 hours with virtually no back orders. This prompt and effective response helped to greatly minimize bad publicity. This type of efficiency and responsiveness affects the bottom line and saves lives. Recalling a product is not a task that many businesses relish. If you’re in a position where you need to inform the public that you’ve made an error, then you run the risk of suffering reputation damage. And what’s more, if this error places the public in danger, then this reputational damage is likely to be grievous. If performed well, however, a product recall can help to mitigate this damage – and in some cases, it might even improve your company’s reputation. Everyone knows, after all, that mistakes happen – and rectifying them swiftly is a sign of an effective organisation. Validactor allows interactive, product specific on-the-fly recalls for either sold and unsold products. Purchasers of defective products can be informed one by one while products still on shelfs will become automatically un-sellable.